adidas will be bringing back their “You Wear” basketball series, which debuted during the ’90s. They first released the FYW “Feet You Wear” series, and for 2018, it appears that the style is back with a BYW “Boost You Wear” model. 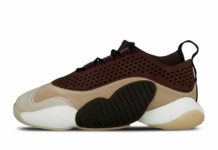 Dubbed, the adidas Crazy BYW LVL 1, which features similar trim detailing and synthetic materials originally found on the FYW pair from the ’90s. It’ll also included Boost cushioning to add excellent comfort on court. Both Nick Young and Brandon Ingram debuted the adidas Crazy BYW LVL 1 basketball shoe last night against the Warriors. Look for the adidas BYW LVL 1 to release at select stores on January 27th, followed by a global release on February 15th.